Get ready to experience the grand age of reptiles with Slideasaurus™, the newest dynamically graphic slide from Ninja Jump. The dinosaur slide's realistic scales, claws and mouth are as impressive as his 85-foot body length! Visitors embark on their Jurassic experience through the jaws of the dino slide and climb up 17 feet to the top of sliding platform and cruise down the curving back of the Slideasaurus™. 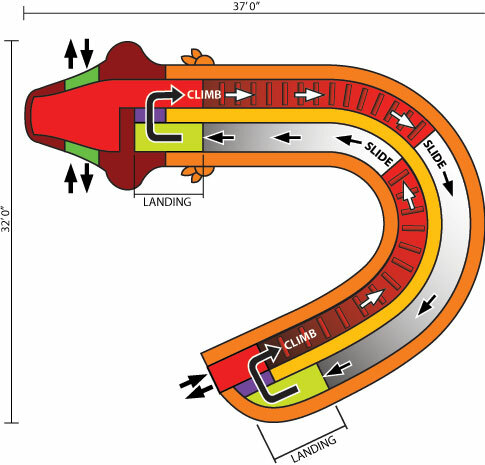 The 180-degree slide allows the journey to continue; participants can then climb back up the curving dino tail and enjoy a straight slide down through the Dinosaur's mouth. This provides a 190 feet of continuous climb and slide thrill on a single full run. The Slideasaurus™ 180 slide is made of lite n strong™ and fire-resistant vinyl making it portable, safe and durable. 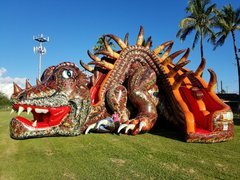 This bigger than life inflatable slide is guaranteed to be a crowd stopper of any corporate event or carniva!.